It’s hard to wrap your head around the size of Lake Superior. At the Plenary Session at last week’s National Estuarine Research Reserve Annual Meeting in Duluth, Minnesota, folks from the Lake Superior Reserve threw facts out at us: it’s the largest freshwater lake in the world by surface area; the lake holds 10 percent of the world’s freshwater; its waters could cover all of North and South America by a foot. It’s also 1300 feet deep at its deepest part and filled with hundreds of shipwrecks, its legacy from the years of trading that ran through the lake (and still do). At the weeklong meeting along the shores of the Lake, sector groups from the 29 Reserves in the Reserve system met daily: reserve managers; coastal training program managers; research, steward, and education coordinators; and representatives from the friends groups and foundations that support each reserve (like us!). Evidence that Duluth is a summer hotspot was present in the t-shirt shops, boat tour kiosks, and ample parking lots, but in early November the tourists were gone and the streets were instead crawling with scientists and educators. It is humbling and exciting to really recognize the size of the Reserve system and the passion of so many people working at our estuaries. Representatives from the newest reserve to join the system, He’eia in Hawaii, mingled easily with reserve staff from more than 20 other states. Folks from Old Woman Creek in Ohio were happy to talk with the other freshwater reserve, Lake Superior. 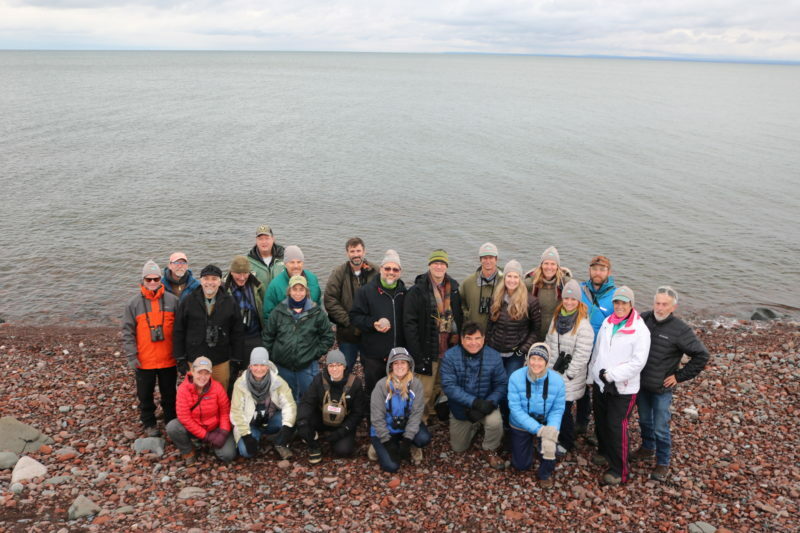 Joint sector meetings allowed a cross pollination of ideas as well as a chance to meet new people – as did happy hours, amazing snack breaks, birdwatching and shore cleanup outings, and a closing night dinner and dance at the Lake Superior Aquarium. As a representative of the Great Bay Stewards, it was invaluable to meet folks from similar organizations around the country, from Washington state to Florida to our neighbor, Wells Estuarine Research Reserve in Maine. It was equally wonderful to dig into the work (and challenges) of the researchers, educators, training program managers, and stewards that work at Great Bay and the other Reserves. Each day brought new ways of seeing the accomplishments and possibilities of the Reserve system. Some days also brought wonder to the employees of the southern reserves, who could be found outside between meetings, recording the falling snow on their phones.